With a flock of 6.57 millions, main sheep products are mainly for export to different countries in the world. Wool -with various levels of processing-, sheep meat, sheepskins, lanolin and breeding stock have signed the high profile of Uruguayan exports. Various types of sheep breeds are bred in farms, and there have been marked changes in the proportion of breeds with the years. An initial period of grading up to Merino–type breeds imported from Europe, USA and Australia, was followed by a strong predominance of Lincoln and Romney crosses at the beginning of this century when there was an important demand for mutton meat in Europe. In 1930, after a period of alternated cross–breeding systems using Lincoln and Merino rams it started a process of grading–up to imported Merino related breeds from Australia and New Zealand, mainly Corriedale and Polwarth. The present distribution of sheep shows a predominance of breeds defined as “dual-purpose” in the sense that generate income from the sale of wool and sheep meat (fat lambs, surplus offspring and cast for age animals). Recent results of a national survey showed in 2016 most popular breeds run by woolgrowers were: Corriedale (42 %), Merino (27 %), Polwarth (9 %), Merilin (4 %), Romney Marsh (3 %) and Dohne Merino (2 %). The diameter distribution of the wool produced in Uruguay is a direct consequence of these breeds. The majority of the wool produced can be defined as mid-micron wool, between 25 and 32 microns, while the rest corresponds to wools below 24.5 microns. A more generalized interest in the production of fine and superfine Merino wools (with less than 19.5 microns) is being observed in the last years. With that micron profile it is possible to manufacture a wide range of end-products, mainly for apparel uses but also for interior textiles. Besides an excellent climate and pasture conditions, Uruguay has environmental conditions totally favourable to high quality sheep production. Some remarkable characteristics of the “high-quality” wool produced in Uruguay are the high values of scouring yield (between 75-81 %) and low vegetable matter, the low incidence of dust penetration and tip weathering and good staple length. The wool industry in Uruguay is mainly oriented to export markets. Early stage processing is well established in Uruguay and this is the consequence of very strong investments in the combing sector during the last years. 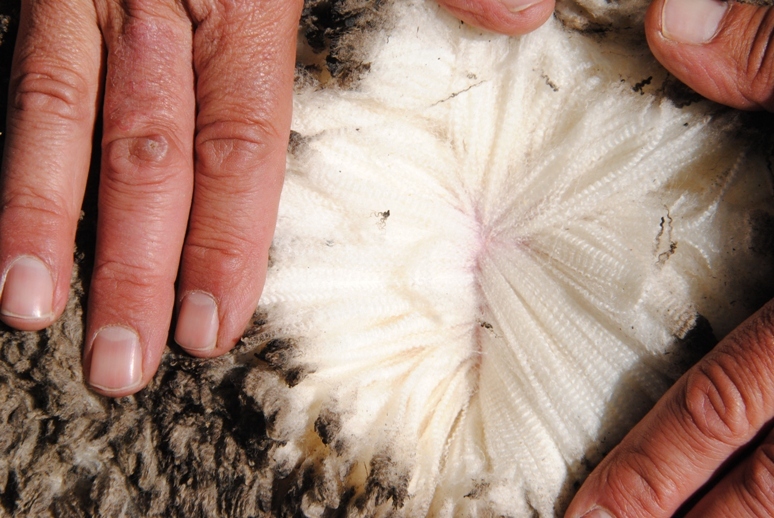 Wool is mainly exported in the form of tops, but also scoured and greasy. Other textile products with larger added value are also exported, such as yarns, fabrics, garments, bedcovers, and rugs. Annual exports of wool and wool products in the 2017 season reached a total of 41.0 mkg (greasy basis). As in previous years, the majority of the wool (53.3 %) was exported as tops. Scoured wool represented 28.1 % and greasy wool the remnant 18.6 %. In the last years China has become our main client, buying 45.1 % of total wool exports in the 2017 season. Other major importers include Germany (15.8 %), Italy (7,4 % %), Turkey (5.3 %), Bulgary (2.8 %), Mexico (2.7 %) and India (2.7 %).